Terry and Susan are comfortable. Every weekend for the past three years, they have been enjoying their usual favourites from the local take away. But this week, Mr Wang's Yum-Yum Hut has a surprise in store for them. . .
Terry and Susan's kitchen, in the evening. August 2010. Directed by Steve Small. SUSAN gets up and goes over to him. She leans in towards his face. TERRY flinches. TERRY: What are you doing? SUSAN: I was going to give you a kiss. Is that alright? TERRY: Yeah, sure, just . . . wait . . . He shoves more food into his mouth. He chews rapidly, gesturing for her to hold on a second. Eventually he beckons her in. SUSAN kisses him on the mouth. She pulls back. TERRY stuffs his face. SUSAN returns to her seat. SUSAN: Did you enjoy your cigarette? TERRY puts his cutlery down. TERRY: Alright, Jessica Fletcher, well done, you got me. Yes, I enjoyed my cigarette. In fact, I enjoyed two cigarettes. Two cigarettes and I enjoyed every last foul tasting, carcinogenic, life-shortening millimetre of both of them. Happy? TERRY: Good. Then we’re both happy. SUSAN: Good. I’m glad you enjoyed your fags. Tell me, do you have one before and one after your jogging? Or do you just have them both on the run? Maybe you should just take a six-pack of lager out with you next time you go for a jog. TERRY: That’s not a bad idea. SUSAN: God knows it’s the only kind of six-pack we’ll be seeing in the foreseeable future. TERRY: I’m sorry that I repulse you so. I truly am. SUSAN: You don’t repulse me. SUSAN: You’re just getting fat, is all. SUSAN: You’re starting to look like a chubby little German. TERRY: I’m starting to look like a what?! SUSAN: You are. You do. You look like a chubby little German tourist. A chubby little German tourist like you get in Spain. TERRY: Susan, dearest . . . there are many, many things that are wrong with what you just said, but not least of these is the sheer bloodyminded hypocrisy of you calling me chubby. Just saying’. How’s your lemon chicken and egg fried rice? TERRY: Lovely. Enough batter on that bad-boy for ya? SUSAN: How’s your chicken and cashew nut? TERRY stares at his food. He puts down his cutlery. He stares at his food some more. TERRY: Awful. It’s just . . . bloody awful. I used to like chicken and cashew nuts. Used to enjoy it. Used to enjoy a lot of things. Tim is an Edinburgh-based writer who wrote his first full length script, This Here Now, for the Lyceum Youth Theatre at the age of 18. Since then, he has written more than twenty scripts for youth theatres of all ages across the country (including Strange Town Youth Theatre and Young Company). His 2002 play Porcelain Dolls was recently translated into Norwegian and performed at the Rogaland Teater, Stavanger, under the title #Sweet. 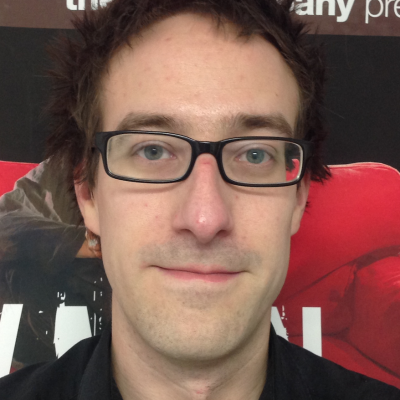 His directing work includes the 2011 Fringe sell-out Hex, which he co-wrote with Sam Siggs for Strange Town. 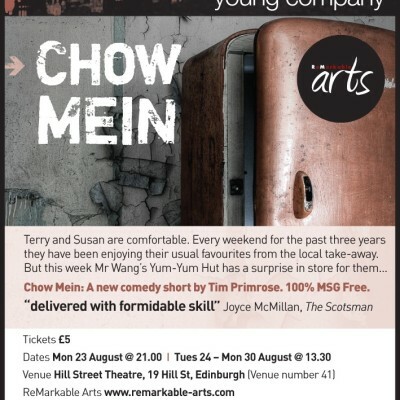 His first professionally produced script, Broth, was performed as part of 2015’s A Play, A Pie and A Pint season at Glasgow’s Oran Mor and Edinburgh’s Traverse Theatre. Please click below to join the Strange Town audience mailing list.